I will simply save all the good ones here. 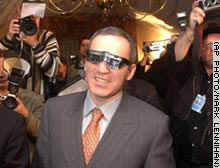 Garry Kasparov wears 3D glasses during a news conference in New York this week. Kasparov will play chess against a supercomputer in a series of matches to be broadcast live in 3D by X3D Technologies. NEW YORK (Reuters) -- International chess great Garry Kasparov said he wanted to prove "human players are not hopeless" when he battles world champion computer program Deep Junior next week in the latest "Man vs. Machine" contest. The Azerbaijan-born Kasparov, who has played computers three times since 1989 and famously lost to IBM's supercomputer Deep Blue six years ago, will pit his skill and intuition against the Israeli-built software program over six games in New York starting Sunday. "After the other matches I felt hooked to be part of this competition because I believe it is very important for the game of chess and the human race as a whole," Kasparov, 39, said Thursday at a news conference. "Now I hope to use my experience to help set new standards and also prove that human players are not hopeless." The developers of Deep Junior, programmers Shay Bushinsky and Amir Ban, said at the same news conference that the computer's key to success in the $1 million match will be how efficiently it uses its considerable calculating ability. "I think what we are seeing at the moment is getting away from the materialistic shape that programs used to play chess and moving into a new era where chess programs understand more abstract concepts," Bushinsky said. Kasparov could be distracted by the weather, his personal life or tiredness, but all the computer has to worry about is losing power. Deep Blue, custom built by IBM to play chess, made history in 1997 by becoming the first computer to defeat a reigning world champion in a match played under classical chess conditions in which games can last as long as seven hours. IBM retired the machine after the match in New York. Since then, Kasparov lost his world title in 2000 to Russian grandmaster Vladimir Kramnik and Kramnik tied a "Man vs. Machine" eight-game match against a German-built program, Deep Fritz, last year in Bahrain. The word "Deep" in front of the names of the programs means they run on parallel processors. A single-processor version of Deep Junior was released commercially almost two years ago and can run on a PC. Deep Junior calculates roughly three million moves per second, compared with Deep Blue's 200-300 million, but experts say Junior is far more flexible in its decision-making. Kasparov was widely considered the greatest player in chess history before he was beaten by Kramnik, his one-time protégé. Deep Junior won the world chess computer championship last year and Kasparov has had access to that version of the program in his preparations for the New York match. The six-game contest, with the games spread over 13 days and ending February 7, is sanctioned by the International Chess Federation, known by its acronym FIDE, and will be played under classical chess rules. Organizers said Kasparov is being paid a fee of $500,000. Another $300,000 will go the winner and $200,000 to the loser, or $250,000 to each contestant if the match is tied. One point is awarded for winning a game, and each player receives a 1/2 point in the event of a draw. In 1997, World Chess Champion Garry Kasparov played IBM's Deep Blue computer in the most famous Man vs. Machine match to date. Ever since Deep Blue, a new generation of super-computers has been competing every year. Deep Junior, three-time world champion, won the last official world chess championship for computers in July 2002, in Maastricht, Netherlands, against 18 other machines. Now, X3D Technologies presents the First Official World Chess Championship: Man vs. Machine, sanctioned by F.I.D.E. (Federation Internationale des Echecs), I.C.G.A. (International Computer Game Association) and U.S.C.F. (United States Chess Federation). World Chess Champion, Garry Kasparov, will play reigning computer Chess Champion, Deep Junior in a world-broadcast event. The match will take place at the New York Athletic Club. Kasparov and Deep Junior will play six games over a two-week period beginning January 26 and ending February 7. The matches will be broadcast live over the internet in Extreme 3D at www.x3dworld.com. 2D game playback with commentary and live photos will also be available at www.x3dworld.com. A V.I.P. reception will be held January 23. F.I.D.E. President Kirsan Ilyumzhinov stated in Moscow: "New York is the best place in the world to showcase this historical event and promote the game of chess as a symbol of friendship between all the countries." NEW YORK (Reuters) -- World champion chess computer software program Deep Junior pounced on a glaring error by Garry Kasparov on Thursday to draw level with the Russian grandmaster half-way through their six-game match in New York. Playing with the white pieces, the Azerbaijan-born Kasparov blundered with a rook move on his 32nd turn of the third game, allowing the machine to go two pawns up in material and establishing a winning endgame. "This was a time pressure move that is ridiculous by his high standards," U.S. grandmaster Maurice Ashley said. "It makes the greatest player of all time look very human." Kasparov's furious reaction at the board when he realized his mistake left no doubt he had betrayed himself after playing an enterprising game that appeared drawn even though the human player had less time on his clock. The former world champion who is still ranked number one, shook his head vigorously, stared up at the ceiling and covered his face with his hands as the computer crunched out the win. Kasparov resigned on the 36th move after three hours and 45 minutes because his position was about to become hopeless with three pawns and his queen to Deep Junior's five pawns and queen. Kasparov, whose battles with the IBM supercomputer Deep Blue in 1996 and 1997 drew worldwide attention, has vowed to avenge his defeat to the machine six years ago, but now faces a tough psychological struggle for the remaining three games. "Kasparov blundered ... at that point the position was probably a draw," said U.S. grandmaster Lev Alburt after watching the game at the New York Athletic Club. The $1 million match billed the "International Chess Federation Man v Machine World Championship" is tied at 1-1/2 points each with the fourth game scheduled for Sunday. One point is awarded for a win and half a point for a draw. Kasparov won the first game last Sunday and Tuesday's second game was drawn. The human programmers of the Israeli-built software program that runs on a PC were excited by the victory. "Behind this is the accumulation of a lot of effort and this is the epitome of what we are doing," said programmer Shay Bushinsky, who along with fellow Israeli Amir Ban have worked on Deep Junior for 10 years. "Deep down in our hearts we are happy." 06.02.2003 The cable sports network is going to provide live coverage of the sixth game of the Kasparov-Deep Junior match on Friday! They are sending a crew to the New York Athletic Club to transmit the game. This is a big first and the first live national TV coverage of a chess event since Fischer-Spassky. In 1995, ESPN broadcast packaged spots on the Kasparov-Anand match, but they were produced by the PCA. This time around ESPN itself is footing the substantial bill. a six game man vs. machine contest. Kasparov was attempting to avenge his defeat in 1997 by IBM supercomputer Deep Blue. This time around, playing in New York against Deep Junior, Kasparov and the computer won one match each and drew the remaining four. Kasparov appeared to be in a winning position when he first offered Junior the chance to accept a draw, an offer which was refused only for the computer to offer Kasparov a draw five moves later. The 39-year-old grandmaster was booed by the crowd for accepting the draw but after the match he was unrepentant. He said he would have pressed for a win in a similar position against a human opponent but he feared even a tiny mistake would have been severely punished by the computer. "I had one item on my agenda: not to lose. 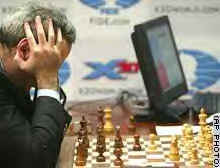 I decided it would be wiser to stop playing," Kasparov said. Deep Junior can process 3 million chess moves per second -- far fewer than Deep Blue's 200 million, but Deep Junior's Israeli programmers say it thinks more like a human, choosing strategy over simply capturing pieces quickly. Deep Blue made chess history six years ago when it defeated then-world champion Kasparov in a six-game match in New York. Last October, current world champion Vladimir Kramnik of Russia tied his eight-game match 4-4 against a German-built program called Deep Fritz in Bahrain. Deep Junior, which won last year's world computer chess championship, and Kasparov each won $250,000 for the match played over 12 days. 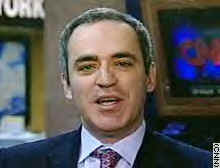 Kasparov was also being paid a $500,000 appearance fee. Azerbaijan-born Kasparov is considered by many chess experts to be the greatest player in chess history and is still ranked No. 1 ahead of Kramnik by the International Chess Federation, known by its French acronym FIDE. on the Kasparov vs. Deep Junior Match. Copyright (©) A.J. Goldsby I; 2005.